Concerned about your bone health? You should be. The sooner you start the better. 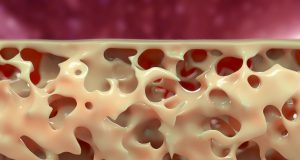 Your risk for osteoporosis, where your bones become fragile and porous, has a lot to do with the bone mass you’ve developed in your 20s and 30s and what you’ve done to prevent losing that bone mass later on. Bones, like the rest of our body parts, are living material. They’re in a constant state of remodeling, breaking down and building up. Interesting tidbit: Physiologists say we create about 11 skeletons over the full course of our lifetimes. So, our bodies work hard to keep our bones healthy. There are simple lifestyle changes you can make to reduce bone loss naturally—and it starts with foods for strong bones. We know that in women post-menopause, estrogen levels take a nosedive and bone loss speeds up. Estrogen plays a role in laying down healthy new bone in the body. Stats suggest that half of American women over 50 will likely fracture a hip, vertebra, or wrist because of weak, vulnerable bones, and roughly one in five will end up with full-on osteoporosis. Men are at risk too, but women especially have been told they need enough calcium to fight bone loss. When it comes to vitamins for bone health, calcium is not the answer after all. Research in recent years has overruled the high-calcium recommendation. Too much calcium (and calcium supplementation) can actually damage your bones in many cases, doing quite the opposite of what scientists first thought. It can cause constipation and have a negative effect on the absorption of other nutrients. The focus now is on dairy-free food sources of calcium. Foods good for your bones are broccoli, leafy green vegetables (can you ever get enough kale? ), tofu, almonds, beans, and sesame seeds. These are definitely some good choices to consider adding to your diet on a regular basis. You need about 500 to 800mg a day (one cup of cooked broccoli has 180mg of calcium, just to give you an idea). Dairy, like cheese and ice cream in, is acidic, and your body is better off eating food with a more alkaline pH. When you eat a lot of dairy, your body pulls calcium from your bones to try and neutralize the acidity. That’s not good for your bones. So, you want to limit acidic foods. Besides dairy, watch out for acidic meat, sodas, added sugars, alcohol, and packaged food. You want to assist with the absorption of all the nutrients and vitamins for bone health that really count, like magnesium and vitamin D.
Good bone health—if you’ve already got it—really does have a lot to do with a healthy diet. Eat fresh, whole foods and make your meals from scratch. It’s not always easy, but you’ll be better for it. In fact, loading up on produce is one of the best ways to improve bone density. Make a habit of eating six to nine daily servings of fruits and vegetables. It’s time to acquire a taste for Brussels sprouts, turnip, and mustard greens! You’ll keep your blood alkaline and benefit from other bone-friendly nutrients in these foods like phosphorous and vitamin K.
How about dried plums? They’re good for more than keeping you regular. A 2011 study in the British Medical Journalrevealed that women who consumed 8 to 10 prunes a day had higher bone mineral density than those who ate dried apples. Why prunes? They give you potassium and boron, both good for bone health. Strontium for bone health is another popular nutrient. Chemically similar to calcium, strontium is considered valuable to support healthy bones. The main food source for strontium is seafood, so treat yourself to shrimp, clams, crab, and lobster. If you’re not a seafood person, other sources include wheat bran, poultry, and root vegetables like sweet potatoes. Cut back on coffee and switch to herbal tea—or at least limit your caffeine intake. Coffee is acidic and full of caffeine. Although it’s a great stimulant, it does hinder calcium absorption. You want to take every precaution against your body leeching calcium from your bones, making them porous and brittle and more prone to injury. Steer clear of salt. Sodium is reported to increase calcium loss in urine. You want to cap your intake to 2,300 mg a day, which may sound like quite a bit, but start looking at your food labels and beware. It’s roughly a teaspoon a day. You know too much is bad for your heart—well, it’s not great for your bones either. Keep your stress levels in check too. That’s because the stress hormone cortisol is a steroid. Over time, high levels of steroids can increase your risk for osteoporosis. Try meditation or tai chi, for example, as methods of stress relief. Another key way to keep bones healthy is exercise. Ideally, weight-bearing activities like jogging, jumping rope, and dancing are recommended because they place a higher load on your muscles, tendons, and bones, which respond by getting stronger. Lifting weights has the same effect, so dust off those dumbbells (or try soup cans) and give it a shot. But if all that’s just too daunting for you, start with short walks. Even 10 minutes a day can help. Make these healthy lifestyle choices a habit and you’ll be on your way to strong bones. And don’t fear the Brussels sprouts—steamed in broth with a bit of olive oil, they can be quite appetizing. Consuming excess protein is known to cause acidity in the body, which leads to calcium loss in the urine. The average amount of protein is only two to four ounces of lean protein, three times a day—Americans eat, on average, two to three times as much. Commonly used medications for heartburn and Hiatal hernias include Nexium, Protonix, Prevacid, Tagamet, and Zantac. These drugs work by blocking stomach acid production, but adequate amounts of stomach acid are needed to absorb minerals such as calcium, magnesium, and zinc. The use of these types of drugs can increase the risk of developing osteoporosis as a result. The best source of vitamin D is simply spending some time in the sun, and when the sun rays hit your skin, your body produces vitamin D for free. This vitamin is very important for the absorption of calcium in the gut. Vitamin D is also important for immune system modulation, combatting depressive symptoms, and regulating autoimmune disorders. Most supplements contain 400 to 800IU, which is inadequate for most people in northern latitudes. So, get out there and soak up some sun (with sunscreen of course). Adequate levels of hormones are required for proper bone maintenance. Menopause in women (decreases in estrogen) and andropause in men (decreases in testosterone) are common reasons for bone loss. Other bodily hormones may also play a role in bone loss if levels are not at optimal levels. These include cortisol, insulin, and parathyroid hormone. Seeing your doctor regularly will likely catch these decreases in various hormones and prompt treatment right away. Certain foods in our diets may be contributing to the excess bone loss. These may include refined sugars and starches that elevate insulin levels and cause increases in osteoporosis. An ideal diet is the “low glycemic index” diet, which are foods that turn quickly into sugar once consumed. Low glycemic index foods do not raise blood sugar or insulin levels quickly, therefore, they do not cause large fluctuations in insulin levels. More low glycemic foods include lean proteins, beans, vegetables, and good fats (nuts, olives, olive oil, fish, fish oils, avocados). Eating foods high in fiber is also a great way to lower sugar and insulin levels as well as lower cholesterol. Cortisol is a hormone in the body that increases in times of stress. If these levels are high for prolonged periods of time, they can cause bone loss. Cortisol antagonizes insulin and leads to insulin resistance, eventually raising blood sugar and causing calcium loss in the urine. Relaxation techniques such as yoga, tai chi, meditation, massage, and prayer may help decrease cortisol levels. Getting adequate sleep, taking a vacation, and even getting psychotherapy if required should be considered if you think you are becoming overly stressed. Moving your muscles helps stimulate bone strength. Any weight-bearing exercises such as walking, hiking, climbing stairs, and weightlifting can help increase bone density. Exercising for as little as 15 to 30 minutes a day can do wonders. When lifting weights, it is important to not over exert yourself, as being safe should be your top priority. You can also use your own body weight for exercises.